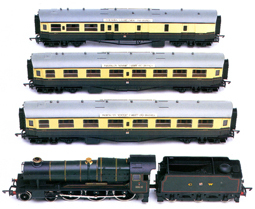 Information: Developed late under Great Western Railways (GWR) ownership, the County Class was unique in many mechanical aspects when compared to the many previous 4-6-0 designs. Details: Many features incorporated in Frederick Hawksworth’s design were unique to the GWR. The County Class was designed and built prior to Nationalisation in 1948, but took impetus from previous LMS designs that were revealed to Hawksworth when Stanier 8F’s were built at Swindon during WW2. Originally proposed as a 4-6-2 design using Walscharts valve gear, Hawksworth was not given the latitude to bring his design to fruition. Hence the compromise was made in a 4-6-0 design that broke tradition with Swindon. Ultimately 30 locomotives were built between 1945 and 1947. The County Class was intended for mixed traffic use; although the emphasis appears to have been on express passenger operation, hence the large driver wheels at 6’-3” diameter. The boiler was similar to the above mentioned Stanier design, while the running gear was almost identical to Hawkworth’s own successful modified Hall design. After 1955 the entire class was fitted with double chimneys in order to improve crew draughting complaints. As such, the County Class never found favour with die-hard GWR crews, preferring more traditional designs such as Castle’s, King’s, and Grange’s. None-the-less, as mainline locomotives the Class performed well as mixed traffic locomotives. The Modernisation Plan brought around the end of the County Class starting in 1962. All members were withdrawn by 1964 with none being set aside for preservation. However, the hybrid design of the LMS Stanier boiler and Hawkworth’s own modified Hall was not lost on members of the Didcot Railway Center who have set about recreating a County from existing scrapped locomotives. Once complete the “new” locomotive shall take the name and number of former Class member 1014 County of Glamorgan.